The Logger is a convenient and extremely portable cast iron patio burner which doubles as a barbecue. It is also ideal for camping as the burning is completely contained. Comes with an interchangeable solid top with hot plate and a large grill / griddle plate* for cooking directly over the flame. You can also use your own cooking pots / kettle / wok / paella pan (KETTLE SHOWN IS NOT INCLUDED). 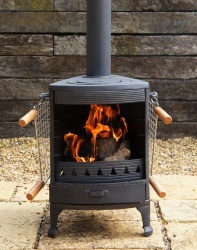 Unlike traditional chimineas, the Logger is made up of stacking sections which literally sit one on top of one and another. Some people who do not intend to regularly move them do like to fire cement joints despite the fact that this is not actually required. Others prefer to be able to easily take it to bits and move in a matter of seconds. It's portability has made it very popular with car club enthusiasts that like camping and re-enactment groups amongst others ! There are only two screws that you need to put in and this is to attach the connector that accepts the flue to the stove body of the unit. Fuel can be loaded through the removable top or via the flap / door at the front of the unit. Logs and charcoal are recommended. This unit should always be stood on a non combustible base for safety reasons - so be sure to place a slab or similar underneath if using on wooden decking. Don't forget that it is the nature of cast iron to rust outdoors if left unprotected. I actually like that - I love the patinsition of cast iron once the surface gets a chance to rust. You can respray or paint if ever needed to give additional protection. The flue pipe that comes with the logger is purposely light weight, painted pipe.. specifically made this way for portability. We have many customers using these loggers now in yurts. Please note that the pipe supplied is not suitable for yurts and you'll need to look at purchasing vitreous enamelled or stainless pipe in longer lengths and much heavier duty for this use. Please remember that you need to SEASON cast iron and bake paint on - so start with a few small fires, each time doubling fire size and burn time and then allow to cool before next fire. Three or four curing fires will be fine - but do make sure that the cooking grid is in place during the curing burns. The cooking grid will be a different colour to the rest of the unit as it's coated in a food grade wax that need baked on during curing before you use it to cook food.